This map displays the most up to date rabbit virus monitoring data available. 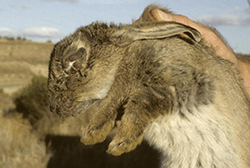 This includes both possible disease and confirmed reports of rabbit virus: (1) Existing rabbit biocontrol agents (Myxomatosis and RHDV1 Czech strain); (2) Known rabbit viruses in Australia, namely RHDV1 (Chinese strain) and RHDV2; and (3) Rabbit biocontrol agent proposed for release in 2017, namely RHDV1 K5. To add information, please select the Record Potential Disease tab. New user (Register here) or Login. 5. Rabbit warren at this location? 5a. Number of active entrances? 6. Rabbit dung at this location? 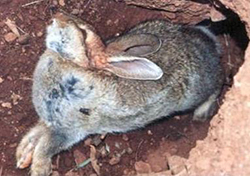 Click on the map where the rabbit was located. 3. What disease do you suspect is present? Please only submit one sample per record. 4b. Please place your rabbit in a plastic bag and label the bag (eg. Rabbit-1). Record the bag label below, and place the rabbit in a freezer until a sample kit arrives. Please submit a new record for each rabbit. 5. Has K5 been released at this locality recently?